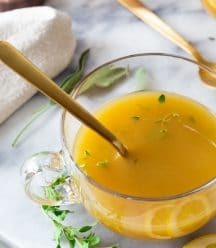 This healthy immune boosting broth is easy to make and so delicious! Perfect for when you feel a cold coming on. In a large pot, bring all of the ingredients to a boil and reduce the heat to simmer. Cook for 20 to 30 minutes. Strain the broth into a large bowl or container with a fine mesh strainer. This will separate the solid ingredients from the broth. The Nutrition Facts are an estimate only. If you don’t like spicy food, omit the cayenne pepper or add to taste. Makes 8 (1 cup) servings. Store in an airtight container in the refrigerator for up to a week or freeze for up to 3 months.